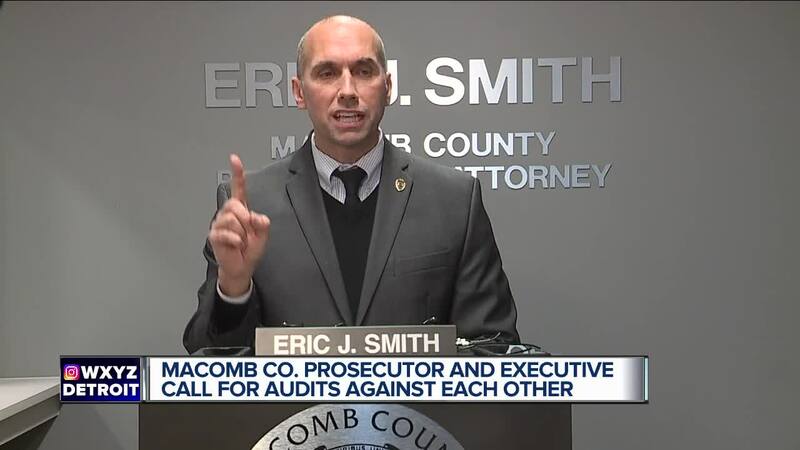 The Macomb County Prosecutor and Macomb County Executive are calling for audits of each others offices. MOUNT CLEMENS, Mich. (WXYZ) — The battle over the books in Macomb County has gotten personal and even ugly. It involves County Executive Mark Hackel, County Prosecutor Eric Smith and County Treasurer Larry Rocca. Hackel wants the Michigan Attorney General to investigate 4 off-book bank accounts the Prosecutor had for several years that handled $1.8 Million dollars. The Board of Commissioners last week voted unanimously to hire UHY to conduct a forensic audit. The funds must be used for law enforcement purposes. Some questionable payments have been made. The first news conference of the day was called by Prosecutor Smith, who said, it became known that an officer with UHY was Hackel’s campaign manager and others in the firm donated to Hackel’s campaign. “Mark Hackel got caught with his pants down. How many other contracts and millions of dollars, drenched in political favoritism have been handed out in the shadows without proper transparency,” Prosecutor Smith said. Hackel says he wants County Commission Chairman Bob Smith to step back from all of this as the Prosecutor’s brother. Smith says he wants a forensic audit of the Treasurer’s Revolving Fund because Smith says there are questionable expenditures in it. A spokesperson for the Michigan Attorney General says they have not received the formal request for an investigation and did not comment.